For buyers, pricing in the wholesale natural gas market is attractive. 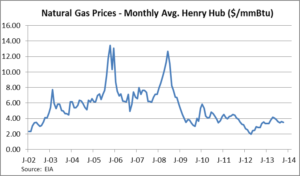 The graph below shows natural gas prices over the past ten years. While we are not at the absolute low, we are near the bottom. 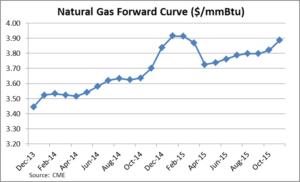 The next graph shows the 24 month forward curve for natural gas. The line is upward sloping, meaning the market expects prices to rise in the future. The story is similar with electricity as the two markets – natural gas and electricity – are highly correlated in the Mid-Atlantic. It is a great time to be a buyer.